Charlie Klendjian (real name Shahe Klendjian) is a telecoms lawyer who re-launched the UK-based Lawyers Secular Society (LSS) in January 2013 and served as Secretary until August 2015. 2.1 A coming civil war? Klendjian spoke at the launch of Sharia Watch UK in April 2014, hosted by Baroness Cox in the House of Lords. In his speech he mentioned what he saw as the ‘increasingly non-benign influence Islam is having on our way of life’. He worked closely with the organisation's founder Anne Marie Waters and contributed to its first report, which he promoted via the LSS website. 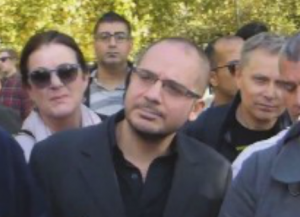 Klendjian gave a speech in Hyde Park in October 2014, alongside Anne Marie Waters. Video of the event shows that he spoke to Alan Ayling, former funder of the English Defence League, who as in the crowd watching the pair, as was Ann Marchini. It is not known if Klendjian knew who either person was. Klendjian's resignation from the LSS came after he had agreed to speak in his LSS capacity at a proposed exhibition of cartoons of the prophet Mohammed, which had been scheduled to take place in London in September 2015. The event was principally being organised by the group Sharia Watch, led by Klendjian's close associate Anne Marie Waters, a former UKIP candidate. Klendjian initially defended the decision to speak at this event on a platform alongside Waters and other far-right figures including Dutch anti-Islam politician Geert Wilders and Paul Weston of Liberty GB, downplaying their well-known racism. However, he subsequently pulled out of speaking, citing 'personal reasons' but claimed that the LSS remained supportive of the event and would sent a replacement speaker. No replacement speaker emerged and by mid August the proposed event was cancelled. Klendjian announced his resignation from the LSS on 19 August, citing 'security fears'. According to British group Hope Not Hate, Klendjian has also played a prominent role in the magazine Vive Charlie, as both a patron and contributor. Though a Hope Not Hate report stated that ‘there is no suggestion that Klendjian has associated himself with the calls for civil war', some of Klendjian’s speeches suggests he may buy into the idea of a ‘Coming Civil War in Europe’ a major theme in counterjihad discourse, viewed as inevitable because Islam and 'the West' are held to be incompatible. Klendjian has argued, for instance, that if Sharia law is incorporated into the British legal system ‘we’ll have to fight to remove it, literally’. On another occasion he stated that 'civil disorder or something akin to a violent revolution’ might be required to reverse its influence, predicting ominously at the end of the same speech ‘we can either fight this battle now, with our words, or we can leave it to the generation that follows to fight it with their blood'. At the University of Manchester Klendjian offered a similarly dystopian vision of a bloody future, arguing (at 4:07 in video, right) that: ‘there is a problem and anyone who denies there is a problem is part of the problem. If we don’t solve this problem with words we’re gonna have to solve it with our fists, our children are gonna have to solve it with their fists, they’re gonna have to solve it with their blood’. Klendjian has also cited counterjihad author Bruce Bawer and directed readers to articles published by the Gatestone Institute on at least two occasions. Lawyers Secular Society (LSS) - Secretary and leading activist, resigned 19 August 2015. The Lawyer, the Mohammed Cartoon Exhibition and the ‘Civil War’ that Wasn’t, Ceasefire Magazine, 7 September 2015. ↑ 2.0 2.1 2.2 2.3 2.4 Hilary Aked, [The Lawyer, the Mohammed Cartoon Exhibition and the ‘Civil War’ that Wasn’t https://ceasefiremagazine.co.uk/lawyer-mohammed-cartoon-exhibition-civil-war-wasnt/], Ceasefire Magazine, 7 September 2015. This page was last modified on 16 December 2015, at 12:03.